If you are interested in learning more about the 101st Airborne Division whilst it was in England then why not visit Littlecote House near Hungerford. At Littlecote you will find a small museum devoted to the history of the house and surrounding area during WW2. A number of books have been written about the 101st's time in England. Click here to see my recommended reading list. The 506th Parachute Infantry Regiment was first activated at Camp Toccoa in July 1942, and 11 months later became part of the 101st Airborne Division (known as the Screaming Eagles). During September 1943 the regiment crossed the Atlantic on the SS Samaria arriving at Liverpool on 15th. It then moved south by rail to Wiltshire and was accommodated in the villages of Aldbourne, Chilton Foliat, Froxfield and Ramsbury. Littlecote House is an old Tudor manor dating from the late 15th Century. It lies in beautiful parkland beside the river Kennet about two miles north-west of Hungerford and three miles east of Ramsbury. The house has a magnificent great hall, long gallery, Cromwellian chapel and Dutch parlour with painted walls and ceiling. 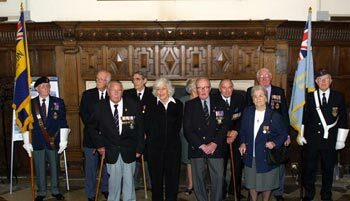 Throughout World War Two the Littlecote Estate was owned by Sir Ernest and Lady Wills, heirs to the W.D. and H.O Wills cigarette empire. In September 1943 the 506th requisitioned the house and it became home to regimental staff, regimental headquarters company and headquarters company 1st Battalion. The house provided office space and sleeping quarters for 506th officers with the best rooms being allocated to Col. Robert F. Sink, Regimental Commander and Lt. Col. Charles H. Chase, his executive officer. All other ranks lived in Nissen huts built alongside the main drive between the house and the east lodge. Shortly after the regiments arrival in England it became apparent that key personnel such as doctors, chaplains and forward artillery observers in non parachute units would need to qualify as parachutists. 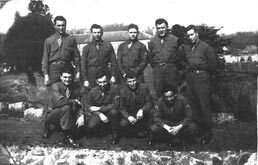 To enable these men to qualify in this role the 101st Parachute Jump School was set up on 21st October 1943 in the grounds of the 502nd Battalion area at Chilton Foliat Camp. Training began on 7th November and by June1944 400 men had qualified as parachutists at the school. The regiment consisted of three battalions and each battalion possessed four companies. A and B Companies of the 1st Battalion and the entire 2nd Battalion were sent to the village of Aldbourne which lies eight miles north-west of Hungerford and 12 miles south of Swindon. The entire 3rd Battalion (HQ, G, H and I Companies) and C Company from the 1st Battalion went to Ramsbury. At Ramsbury a camp had been constructed in a field behind Parliament Piece to house the Americans. However it was too small to accommodate all the men and as a result stables, barns and cart sheds were pressed into use at the Manor, Crowood House, Parliament Piece and the Bell. The regiment conducted much of its training north of the village, particularly in Loves Copse and Pentico Wood. During the last week of May 1944 the paratroopers left Ramsbury and were taken to their D-Day departure airfields at Exeter and Upottery in Devon. The men of the 506th Regiment were among the first soldiers to go into action on D-Day. After six weeks of fighting in Normandy the 101st Airborne Division returned to England, and the men of the 506th Regiment were sent back to their original pre D-Day camps. The regiment had suffered 983 casualties, including 231 men killed in action. Two months passed before they were sent back into combat when the division took part in Operation 'Market Garden' (the invasion of Holland). This ended the regiments year long association with Ramsbury. 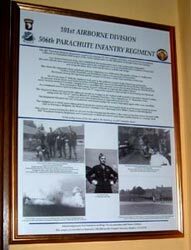 At 11:00am on Friday 17th September 2004 (the 60th anniversary of Operation 'Market Garden') a memorial plaque to the 506th Parachute Infantry Regiment was unveiled in the library at Littlecote. During August 1943 Littlecote was requisitioned by the 101st Airborne Division and on 16th September Colonel Robert Frederick Sink (506th Regimental Commander) and his staff moved in. 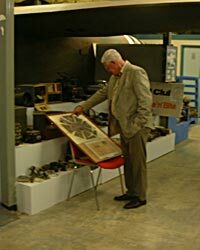 The colonel used the library as his office and it is precisely because of this connection that the memorial plaque has been placed in this room. The ceremony was attended by about 50 guests and visitors including Col. W. Gildner from the US Embassy and Mrs Margaret 'Flip' Swenson, one of Col. Sink's daughters, who unveiled the plaque. We felt very honoured that 'Flip' and her husband Bill agreed to make the long journey from their home in North Carolina to England for the occasion. 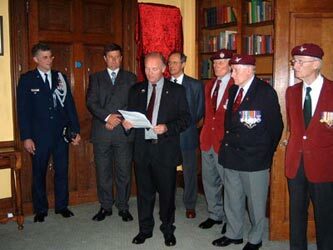 Thanks must also be extended to the following for their help and assistance: John Plenderleith, Ramsbury British Legion Branch; John North, Hungerford British Legion Branch and John Snelling, Parachute Association Newbury Branch. 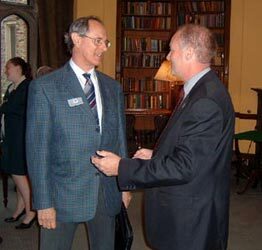 Above left: Event organiser, Rod Ballantyne, in conversation with Roger Day. 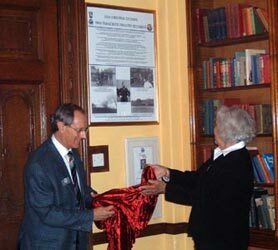 Above left: Mr Rod Ballantyne and guest of honour Mrs Margaret Swenson unveil the plaque. 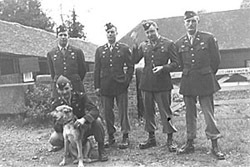 The 506th Parachute Infantry Regiment, a part of the famous US 101st Airborne Division, was sent to the area around Littlecote in September 1943 as part of the Allies' preparation for the liberation of Europe from Nazi tyrany. Col. Robert Frederick Sink, who established his headquarters here, was regimental commander. His staff officers were quartered in the house whilst the enlisted men were accommodated in a number of huts laid out along the main drive between the house and the east lodge. Men from the regiment's three parachute infantry battalions were billeted in the nearby villages of Aldbourne, Chilton Foliat, Froxfield and Ramsbury, where a strong bond of friendship developed among the regiment and the people of the area, a bond that continues to this day. On D-Day June 6th 1944 the regiment took part in the airborne assault of the Cherbourg peninsular. Its mission was to secure and hold a number of bridges and causeways behind Utah beach before capturing the small Norman town of Carentan. Despite heavy casualties their mission was a success and during the middle of July they returned to their camps around Littlecote to regroup and replace losses. At a memorial service held in Littlecote Park on 27th August the regiment paid tribute to the missing and the dead. The Regiment then took part in the airborne assault on bridges in the Netherlands as part of Operation Market Garden, along with the US 82nd and the British 1st Airborne Divisions. They departed on 17th September 1944, a year and a day after their arrival in England from the USA. The Regiment liberated the city of Eindhoven and helped secure the road to Nijmegen, again with many casualties. The regiment as a whole never returned to England but continued to distinguish itself in action across Europe at places such as Bastogne, Belgium, the 'Ruhr pocket,' Germany and capturing Adolph Hitler's home in Berchtesgaden. This plaque commemorates the debt we all owe for the courage and devotion to the cause of freedom shown by men of the 506th Parachute Infantry Regiment, and in particular to those who never came home and lie forever in a foreign field. "At the going down of the sun, and in the morning, we will remember them." Veterans of the 506th Parachute Infantry Regiment held a special 60th anniversary reunion at Toccoa, Georgia in October 2002. Click here for a report and photographs. The Following photographs have been sent to me by Mr Roger Dowson. During WWII Roger's mother, Valerie Loveday, and her sister Norma Jean lived with their parents Percy and Flo at 24 Carr Street, Swindon. Not far away was the 'Majestic' skating rink in Milton Road. (Before the war this had been the town's swimming baths but because of water shortages it was boarded over and turned into a roller skating rink). The rink was very popular with American servicemen stationed in the area and Valerie and Norma Jean became good friends with a number of 506th paratroopers from Aldbourne. They would often invite the soldiers back to their home for a meal, and their parents always made the young Americans feel welcome. Valerie became very close to Pfc Walter L. Lipinski from 'D' Company (Walter is still alive and living in Pittsburgh, Pennsylvania). Her sister was due to become engaged to Pfc William T. Miller from 'E' Company. 'Bill' Miller survived the Normandy operation but was killed on 20th September 1944 at Son during operation 'Market Garden'. Below left: Sgt. 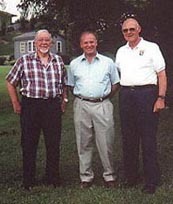 Bob Lundy (left) and Pfc. Walter Lipinski from 'D' Company 506th. This picture was probably taken in Austria. shipment overseas. Right: Norma Jean Loveday (centre) pictured with two of her friends near Herd and Leader's garage in Marlborough High Street. 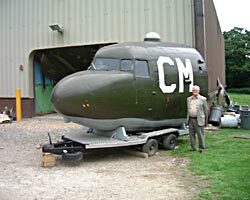 Contrary to what has been published in one or two books and magazines (most notable of these being 'Band of Brothers'), Membury airfield is on the Wiltshire/Berkshire border about two miles east and two miles south-east of Ramsbury and Aldbourne respectively, NOT one hundred miles to the south-west in Devon! The 436th Troop Carrier Group arrived at Membury in March 1944 where they stayed for the remainder of their time in England. On June 6th 1944 the Group, joined by the 85th Squadron of the 437th Troop Carrier Group, carried the 377th PFA, 1st Battalion 502nd and 326th Medical Company to Normandy. The 436th again linked up with the 101st during Operation 'Market Garden' and on 17th September 1944 they dropped the 1st and 2nd Battalions, 506th into Holland. Below left: Officers from the 506th at Littlecote House which served as Regimental HQ (J. Reeder). 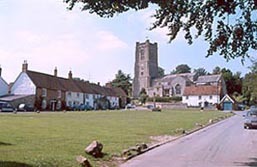 Below right: Aldbourne village green as it looks today. To see how Aldbourne was represented in the TV mini-series 'Band of Brothers' click here. 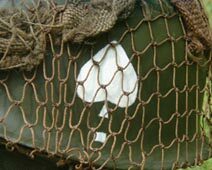 The spade symbol (as used on playing cards) was applied to each side of all 506th helmets sometime towards the end of May 1944. It's intention was to act as a recognition flash so that members of the regiment could easily identify each other in battle. 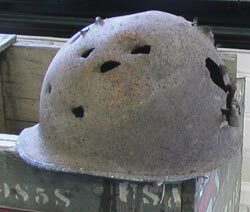 The rusty old helmet shown above once belonged to Sgt. Gilbert Morton of HQ Company, 3rd battalion, 506th. 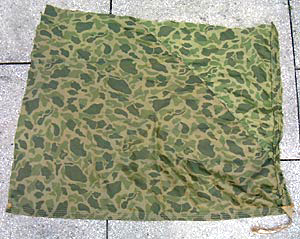 The small dot to the right of the spade symbol signifies the wearers battalion. A dot on the right meant 1st battalion, a dot below meant 2nd battalion, a dot on the left meant 3rd battalion and above signified HQ 506th. Strangely my helmets dot is in the right 1st battalion position. 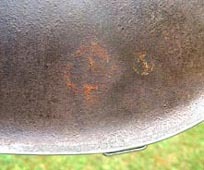 However, as stated above, Gil Morton was in the 3rd battalion and therefore the dot should be on the left. This situation has mystified me for years. At long last the riddle has been solved. 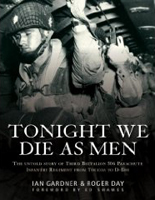 On page 28 of Mark Bando's recently published book (101st Airborne, The Screaming Eagles at Normandy, published by MBI Publishing Company, and highly recommended) he reveals that the entire 3rd battalion of the 506th entered Normandy with the 1st battalion stencil painted onto their helmets in error. So after all these years the mystery has finally been solved. In addition to the spade recognition flash all officers wore a vertical white bar on the rear of the helmet and NCOs a horizontal bar. See above photograph. 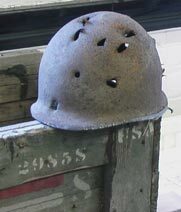 Pictured below is a film prop helmet as used in the TV series 'Band of Brothers'. 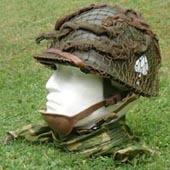 It shows how a 2nd battalion 506th helmet would have appeared when new, and contrasts nicely with the original helmet above. 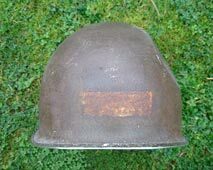 This helmet was found in Pentico copse (an area of woodland laying midway between the villages of Ramsbury and Aldbourne) that was used by the 506th PIR for live firing exercises. Judging by the number of holes it must have been used as a target! 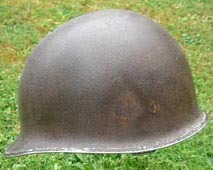 The helmet was photographed at a display of wartime memorabilia held recently in Aldbourne village hall and organised by local historian Mr Graham Palmer. During World War Two Mr Charles Asay was a sergeant in 3rd Squad, 3rd Platoon, A Company, 502nd PIR. During his stay in England he was quartered at a camp built in the grounds of a Georgian mansion called Chilton Lodge. The lodge lies on the Wiltshire/Berkshire border just east of the village of Chilton Foliat. On 5th June 1944 A Company left England from Membury airfield - destination Normandy . 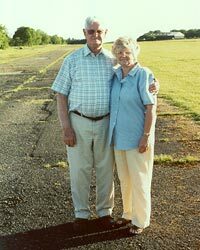 59 years later Charles made a sentimental return to Membury and is seen standing (below left), together with his daughter Gloria, on one of its surviving runways. 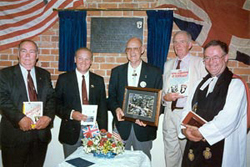 Below left: Joe Beyrle (centre), who was a paratrooper in I Company, stands in Ramsbury Memorial Hall on 18th June 1999. He has just unveiled a plaque dedicated to the 506th Regiment which records the history of the unit during its stay in the Ramsbury area. 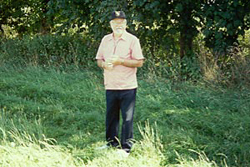 Below right: George Rosie (HQ 3 506th 101st) returns to Ramsbury in 1994 and stands in the field that was once 'Camp Ramsbury'. 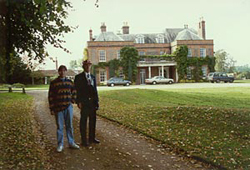 Below left: George Cave (326th Medical Company) at Standen Manor near Hungerford in 1994. Below centre: Lester Hashey (E Company 506th 101st) on the left of the photograph in Aldbourne during 1994. 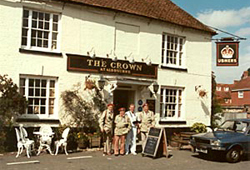 Below right: Roger Day, with 'E' Company veterans Bill Guarnere, 'Babe' Heffron and Bill Maynard outside the Crown public house in Aldbourne. The basement of the Crown was used as E Company command post during 1944. 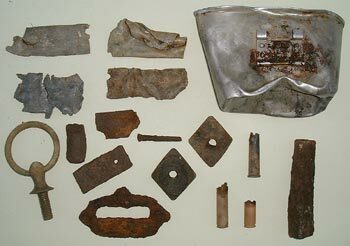 Above: A selection of artefacts found recently in a field near Ramsbury. They include roofing materials (lead and nails), .303 and 30.06 ammunition rounds and a US issue canteen cup. Below: Close-up shots of the canteen cup. 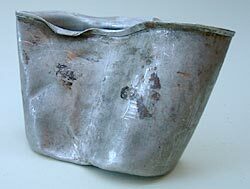 Below: Standard US Government issue mess tin found in the same field as the cup shown above. 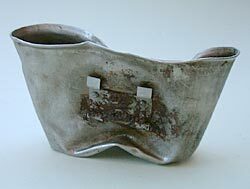 It's made of stainless steel and would originally have had a lid held in place by the folding steel handle. Below far left and far right: This is a standard US issue M3 trench knife in an M6 leather scabbard dated 1943 and belongs to Mr Tim Stubbs of Chilton Foliat. It originally belonged to his father who was given it during the war by a soldier from the 502nd PIR billeted in the village. Below centre left: Standard issue paratroop compass (early issue) also belonging to Mr Tim Stubbs. 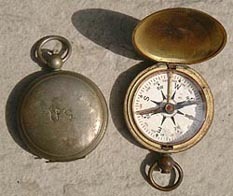 For Normandy paratroopers were issued with a wrist compass, similar to a large watch with a leather strap. With thanks to George King for this information. 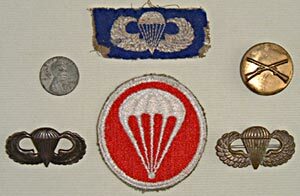 Below Centre right: A selection of badges including silver parachute qualification wings (bottom left and right), artillery sidecap insignia (bottom centre), embroidered parachute qualification wings on blue background (centre top), enlistedman's infantry (crossed rifles) brass collar disc (middle right) and a 1943 dated one cent (middle left). 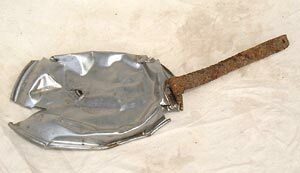 Below: Part of a panel from the parachute used by David Rogers during his jump into Normandy on 6th June 1944. He carried it in his backpack through battles at Ste. Come du Mont, Carentan and Bloody Gulch. This item now belongs to Katherine Stubbs and is shown with her kind permission. 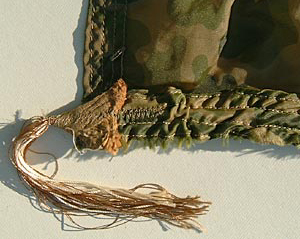 The picture on the left is a close-up of the shroud line attachment. Top left: Joe Beyrle (right), Donald Burgett (left) and myself meeting up in Howell. 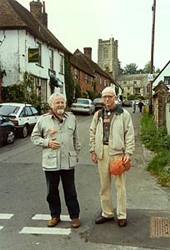 Don was billeted in Aldbourne with A Company. 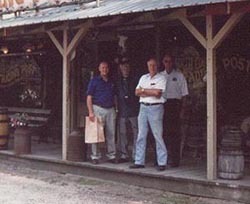 Top right: From left to right - myself, George Rosie, Fred Bahlau and Joe Beyrle, seen at Fred's theme park in the beautiful Irish Hills area. All three veterans were based in Ramsbury during WW2. 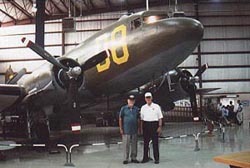 Below left: George Rosie (left) and Joe Beyrle standing beside a C-47 Dakota in the Kalamazoo Air Zoo museum. 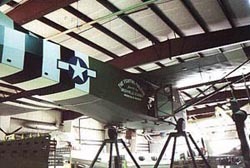 Below right: Waco CG-4A glider which has been fully restored at the Air Zoo. The 506th Parachute Infantry Regiment held a special 60th anniversary ceremony at Camp Toccoa in October 2002. Click here for a report and photographs.